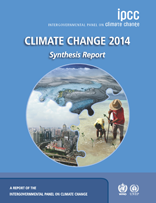 When quoting, citing or distributing the Synthesis Report, its SPM or its individual sections, please provide the full reference: IPCC, 2014: Climate Change 2014: Synthesis Report. Contribution of Working Groups I, II and III to the Fifth Assessment Report of the Intergovernmental Panel on Climate Change [Core Writing Team, R.K. Pachauri and L.A. Meyer (eds.)]. IPCC, Geneva, Switzerland, 151 pp. Translation of the AR5 Synthesis Report from English into the other five official languages of the United Nations is being done by translators working for the WMO Language, Conference and Publishing Services Department. A number of countries are undertaking translations of the AR5 Synthesis Report into languages that are not official languages of the United Nations. IPCC welcomes these initiatives but would note that the translations are prepared under the responsibility of the respective country or institutions. The IPCC does not assume any responsibility for the accuracy of these translations into non-UN languages. In working to achieve the widest possible dissemination of IPCC knowledge, the IPCC is pleased to assist in making these translations available. A number of countries are undertaking translations of the SPMs into languages that are not official languages of the United Nations. IPCC welcomes these initiatives but would note that the translations are prepared under the responsibility of the respective country or institutions. The IPCC does not assume any responsibility for the accuracy of these translations into non-UN languages. In working to achieve the widest possible dissemination of IPCC knowledge, the IPCC is pleased to assist in making these translations available. The Fifth Assessment Report (AR5) was prepared according to Appendix A to the Principles Governing IPCC Work on Procedures for the Preparation, Review, Acceptance, Adoption, Approval and Publication of IPCC Reports. In accordance with this, the first draft of the Synthesis Report was submitted for simultaneous expert and government review. The review comments received and the author responses to these comments are available here. The comments and author responses should be considered within the context of the review process, and are not to be interpreted as assessment results. Only the final publication can be cited or quoted as the results of the assessment.